When it comes to protecting against the elements, boots are the number one footwear selection. Their build creates the greatest amount of foot coverage, often rising past the ankle to include the proper support mechanisms. These boots are often treated to resist debris and abrasions, holding a firm outer shell of protection. Some of the nation's largest industries such as the police force and military find great solace with the use of tactical boots. These sources alone call for a strong build, protective elements, and the ability to withstand heavy amounts of usage. Below we'll introduce 25 different tactical boots. We'll extend the brands and the subcategories to enrich the inclusion of products, teaming footwear options will all desired areas of usage. We will also present a comprehensive buyer's guide that details the components to look for and describe the different areas of usage. 5.11 Tactical is one of the top producers of tactical boots in the nation. Their reach spans many different avenues, citing the police force, military, and law enforcement as their areas of focus. Their ATAC boot marks for the perfect fit for military and law enforcement use. This model is made from leather and fabricated means, allowing for the strength increases you need for protection and the lightweight design needed for fluent movements. The 8-inch height is perfect for encompassing the entire foot and creates a rise to support the ankle. This boot features a zipper that starts at the midfoot and hikes to the insertion point. This allows for easy access in fitting. Applied holding is emitted via a Velcro strap that locks the zipped hold. This mechanism keeps a solid grip above the ankle, creating an ample form of lockdown. The outer shell combines a full-grain leather that is treated to wick away moisture and prevent abrasions. The interior is lined with a light nylon that wicks away moisture and doubles as an antibacterial agent. This lightweight interior build also promotes the notion of breathable functioning. The outer shell is made up of synthetic materials, keeping the user light on their feet. A thick sole is inserted under the shell, providing an even-keeled form of stability. Resting directly under this sole is tracked rubber that creates the necessary forms of traction. This design helps create dual functions from the outsole, possessing properties of shock absorption and pressure resistance. The design of the undercarriage formats a rubber mold that extends thick grommets. These grommets are spaced to apply grips on uneven surfaces and prevent the build-up of debris. The undercarriage rises to create a solid toe box cap, keeping this area protected from abrasions and assisting with lateral movements. Creating ample functioning without the pricey tags is a company called Ryno Gear. Their 6-inch Tactical boots are the perfect fit for those looking for a zip-up function with a military design. The exterior is made up of treated leather that resists moisture build-up and stops abrasions in their tracks. The tongue is fully extended and features additional padding for comfortable lockdown overtop the foot. The sides of the lace box features leather panels, which create for additional resistors at the midfoot. Increasing the protection, this model also hosts side-by-side panels at the insertion point. The zipper runs from the bottom of the outer shell to the insertion point, helping to apply a solid holding mechanism. Additional holding is created via a Velcro strap that goes across the zipper. This helps keep the foot from slipping out of the boot and limits unwanted movement at the interior. The interior is lined with ballistic nylon, keeping a lightweight, breathable interior. The interior also features water resistant treatments, preventing the build-up of moisture and keeping the feet cool with CoolMax liners. The outsole is built from compounded rubbers, hosting a thick presence resting directly under the foot. The build layers the rubbers, creating a midsole for shock abruption and limiting the pressures via this reinforcing design. The undercarriage features the proper hike at the arch, creating a support mechanism that the midfoot can enjoy. This build also teams to the natural design of the foot, allowing for the user to proceed with natural movements. The undercarriage also features thick grommets that work outward from the center. This creates the foundation that user needs to navigate rough terrains. It also helps in reducing debris build-up. To enhance proper footing, this region is also treated to a slip-resistant coating, keeping fluid movement across all surface types. Nothing says quality and functional usage quite like the Smith & Wesson brand. Their expertise has been applied to many years of success in the fire arms space, and this same stability is carried over to their tactical footwear models. Their Breach 2.0 model is the perfect fit when working on the force. This model is teamed with a leather and nylon material combination, giving strength and resistance to the outer shell and providing lightweight stability you need for swift travel. This model is constructed with an extended lace box, stretching from the toe box up to the insertion point. This helps the user with easy fitting and provides control over the tightness for proper lockdown. A gusseted tongue lays over the top of the foot, form-fitting for proper comfort and holding. The side of the boot also features a full zipper system which is secured with the use of a Velcro strap. The toe box is covered with a full nylon cap, resisting abrasions and applying the correct amount of spacing and width for natural toe splay. There is also a pattern overlay at the rear of the shoe, creating a heel counter. This keeps the user stable and upright, allowing for proper movements and extensions. The outsole is made from rubberized materials and houses a midsole that lays flat overtop. This even-keeled inclusion is EVA in build, applying properties that increase the comfort for the user while also reducing the threat of shocks and pressures. The rubberized outsole takes on a stacked build, applying a thick layer for stability and a traction layer that is hoked for arch support. The undercarriage features thick grommets with closer spacing. This makes uneven and slippery surfaces no match for this footwear model. Bates is another brand that excels in the quality of product builds. 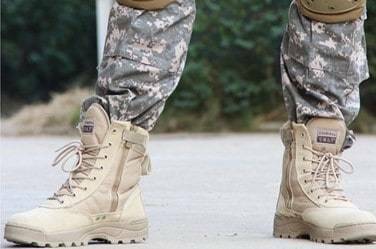 Their Ultra-Lites 8-inch model is the perfect fit for those that enjoy lightweight functionality from their tactical boots. This model is constructed utilizing a leather and fabric combination. The leather component covers a large portion of the outer shell, with the fabric becoming present at the sides and the back shaft of the boot. The leather is treated to wick away moisture and prevent abrasions from penetrating the shell. The fabric inclusion is primarily used to lower the weight of the boot and introduce pockets for air to travel in and out of. The upper is treated with leather paneling, surrounding the lace box and wrapping around the heel. The heel wrap creates an additional stream of stability increase, keeping the user in the proper, upright position. A thick, gusseted tongue greets the top of the foot for proper holding. The insertion point is lined with thick, synthetic padding, with a full collar wrap that keeps the foot fully inserted. The toe box features a full synthetic capping. This cap is used to keep the mold of the toe box and reduce upon the threat of penetrations. The back of the heel features a thick paneling that rises past the ankle. This creates a heel counter that works with the leather wrapping to keep the user upright and operating with a full range of motions. The thick, rubberized outsole is layered for stability and pressure reduction. The first layer is even-keeled and flat, providing the function of a midsole with shock absorbent capabilities. The second layer runs into the undercarriage. It is rugged with grooves and extensions to greet any surface with proper footing and stability. Tactical boots can also come in an athletic build and Under Armour backs their inclusion with many component parts. The Valsetz RTS model was designed for military use, but also holds a presence in the lightweight and gender-neutral space. This model is built from man-made synthetics, hosting lightweight functioning at the outer shell. The lace-up system utilized is drawn via elastic strings, allowing for a stretch when fitting and returning to form for a proper hold overtop the foot. This model encompasses the use of Under Armour's CluthFit technology. This technology creates for thick, extended padding that surrounds the foot at the interior. It also includes a lightweight second skin that wraps for an increase in comfort and stability. The toe box also features a stitched cap that protects from abrasions and resists penetrations. The midsole is made from Micro G foam, a proprietary material to the brand. This helps the user explode with their push-offs and reduces the threat of shocks and pressures. The outsole is fused to the shell, creating a complete model that moves as one unit. This is important for composing an athletic build. The outsole also is thickened at the rear, creating for a cushioned and stable platform for the user to access for push-offs and landing. The undercarriage of this model features a unique, rigid design. The front is loaded with angled extensions, greeting angled and adverse surfaces with ease. The body features thick, rectangular extensions, creating a stable platform. The rear is treated with cuts and grooves for ease of pressure when landing and pushing off. This outsole also undergoes a full treatment to become slip-resistant. The only difference between these two models is that one hosts the side zip function while the other does not. Creating the fashionable mold for tactical use is the Polar Fox brand. Their combat boots feature a finished design, treated to bring out deep tones of brown. This model features a shell this is created from man-made leathers, creating excellence in the protection category. Two buckled straps are located at the rear of the boot, one wrapping around the heel counter and the other reaching near the insertion point. These two mechanisms create for proper lockdown, inducing the proper upright positioning of the foot. They also allow for ease of access into the fitting category, applying a simple fit for the user. The upper tiers are treated to synthetic, leather molds that keep proper shape and lower the total weight of this model. Stitching is prevalent at the outer shell, creating a roomy toe box and a heel counter component piece. The outsole is designed from high quality rubbers, resisting pressures and creating a solid platform for the user to stand upon. The design features a thick platform at the rear, a hike for arch support, and an even patterning continuing to the toe box. Thick grommets extend from the undercarriage to increase the grip on all surface types. This design is also created to reduce abrasions and create a resistance platform that heightens the life of the boots. When it comes to introducing the notion of a steel toe, no one creates a model quite like Rocky Boots. This company has been excelling in the boot production space for decades, adding sound production and quality to any model they feature. 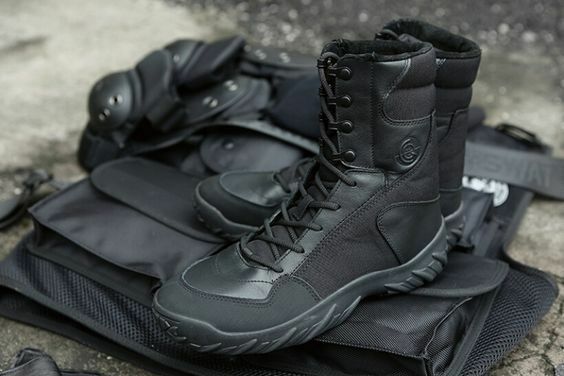 Their Military tactical boot is the perfect fit for the police force, teaming rich blacks with a strong build. This model is built from leather and synthetic components. The outer shell features the leather build that enhances the protection for the user. Synthetic paneling also covers areas of the outer shell, creating a toe box cap, a heel counter at the rear, and side-by-side supports at the midfoot. This model also features a full lace-up system, allowing for the user to apply a simple fit and implement exacted lockdown overtop the foot. The insertion point features a thick, padded collar for a comfortable fit and preventing the foot for slipping out. The outer shell is also treated to host waterproof capabilities, leaving any environment an ample space for usage. The outsole is designed from rubberized components and is thick in size. It features a teamed outsole/midsole combination to reduce pressures and shocks. The outsole extends thick grommets onto the surface, leaving all platform types safe for travel. The undercarriage undergoes treatment to prevent slippage on slick surfaces. The toe box features a steel housing that keeps the shape of this region and prevents any penetrations and pressures. When it comes to a high rise and athletic build, the Belleville brand has you covered. Their Khyber model provides the lightweight functionality you need across a bevy of different usage platforms. This model is made from a leather and synthetic combination, delivering lightweight functioning and the protection you need. The outer shell features paneling across the build, heightening the protection in the toe box, at the heel, and throughout the upper. This model features a full lace-up system, allowing the user to apply a simple fit. The shell features an athletic build, taking the mold of an athletic shoe and building off this mold with a reinforced shank. The insertion point features a thick, padded collar, which helps to hold the foot in place. This helps reduce unwanted movements at the interior when in motion. The outsole is built from Vibram rubbers, which is a lighter take on rubberized composition. The sole features thick grooves and large extensions that are angled for gripping rough surfaces. This outsole is also treated to prevent slippage on slick and oily surfaces, applying solid footing no matter the terrain traveled. The toe box also houses a composite toe, detracting from heat build-up and hosting usage in all climate types. Maelstrom is a company that has committed many years of production to the boot space. Their design models span to all avenues, catering their options to all-purpose usage streams. They even design women's models and their TAC force release marks for a feature on our list of inclusions. This work boot is composed via a fabric and leather combination. The fabric creates for the forgiving means needed to host instances of simple fitting, stretchy pockets, and lightweight build. The leather covers most of the outer shell to protect against abrasions and reduce the threat of moisture. A thick, elongated tongue helps to implement the ease of fitting and produces a comfortable form of lockdown and holding overtop the foot. The interior is lined with a lightweight, breathable material. This material usage also helps to reduce upon the build-up of moisture, keeping the feet cool and comfortable throughout heavy durations of usage. A side zipper mechanism is also included for creating an additional, applied fitting technique. The outsole Is made from rubberized components. These component parts are stacked and layered to increase the stability of the platform and to help perform the natural properties of a midsole. This helps to reduce against the threat of shocks and pressures. The traction pattern is designed from thick extensions. These extensions are stabilized via close spacing and thick widths, creating for an even-keeled undercarriage design. This helps the user glide across any surface type. This outsole is also treated to become both oil and slip-resistant, providing traction in any environment. When it comes to tactical operations, no one takes on the harsh climates quite like Blackhawk. Their Warrior Wear model is the perfect fit for the tactical operator, hosting inclusions that are specific for rough environments. This model is designed via a leather outer shell, creating a positive resistance measure for pressures and abrasions. This model features heavy usage of paneling. These panels are designed with suede and leather combinations, creating solid defenders to abrasions. This material is also treated to resist moisture, making it a perfect fit for the environments that involve water submersion. The insertion point is dipped for ease access, allowing for side stretching to apply the correct fit. The collar of the upper also introduces thick padding extensions that create for the proper hold on the foot. The outsole is built from Vibram rubbers, keeping this model a lightweight option for the user. The design of this region takes on a multisport mold, hiking at the arch for increased support and catering to the natural design of the foot. This helps the user excel from their push-offs and embraces landings with padded cushioning for relief. The design is intended to keep the stamina of the operator high. This outsole is also layered to help reduce the threat of shock and reinforce that platform the user has to work with. The undercarriage undergoes special treatment to host a slip and oil-resistant title, marking any surface as a safe route of travel. Introducing yet another brand that works heavily with the military and law enforcement, CQR is the standard when it comes to tactical builds. Their EDC Outdoor Assault model is a combat boot that enhances fluid movements and teams a sound build for protection. This model is built from synthetic materials, allowing for this model to be included in the lightweight conversation. Paneling and stitching helps to satisfy the increase for protection, teaming attention to specific areas of the boot. Side panels are included across the bottom. This surrounds this model with resistors that reduce the threat of penetration, abrasions, and moisture build-up. The heel counter features an extended build with paneling that overlaps at the way up the insertion point. This creates a solid shank that keeps the user operating the proper, upright position. These models are designed with the inclusion of specific functions that host usage in the law enforcement and military spaces, making them a multi-purpose usage model. The interior is lined with smooth padding. This padding acts with properties similar to that of memory foam, form-fitting the sides of the foot and influencing comfort streams from all angles. The insoles feature a premium and durable design for adding to the comfort inclusions. The outsole of this model features an even-patterned build, perfect for creating a solid foundation of usage. It also features rounded extensions that glide off the surface and can host grip on rough and coarse terrain patterns. When it comes to teaming an option for Air Force inclusion, no one has climate protection quite like Danner creations. Their Tanicus model is built to take on any environment, hosting usage in both warm and cold climate settings. This model is built from a leather and fabric combination, hosting lightweight functioning at a highly protected rate. It also features a rugged design with paneling reinforcement. These panels cater to the side supports, heel counter, the upper, and cap around the toe box. This reduces the threat of abrasions and keeps pressures from breaking down the mold of the boot. A full lace-up system is included for extending the range of fitting and introducing a self-support for lockdown and holding. The laces are also thick and treated with a coating to prevent wear and tear over time. The outer shell is also treated to a ventilation system, allowing for a positive flow of air to and from the boot. The outsole of this model is layered to include a midsole. This midsole helps to reduce the threat of pressures and increase the shock absorption capabilities. The second layer features a traction system that introduces thick grommets to team with the surface. These stabilizers help to influence streams of strong standing across all platform types. This region is also treated to prevent slippage on slick and oily surfaces. Bates has already been features on our list of men's inclusions, but their extended reach makes them a fitting target for female users. Their Code 6 model is a fashionable combat boot that hosts included elements for increased support and ample lockdown. This model is made from a leather outer shell, heightening the protection surrounding the foot. A zipper function is included at the side of this model for applying a simple fit. The upper houses a thick, padded tongue that surrounds the ankle region with comfort. This notion also helps keep the foot fully inserted, preventing from unwanted, internal movements. A widened toe box is included at the front of this model. It also holds its shape, providing plenty of internal spacing for the toes to splay naturally and remain comfortable during movement. A full lacing system is met with metal eyelets to produce a solid hold that withstands the test of time. The design of this boot takes on thick reinforcements, creating for a surrounding that fully pads, cushions, and protects the foot. The outsole is built from synthetic rubbers, making for a lightweight material build that is more forgiving to the surfaces. This creates for streams of natural movements and reduces the pressures placed on the foot. The undercarriage design patterns two platforms of extensions, one at the front and one at the rear. This creates a natural hike at the arch for midfoot support. Teaming the extensions to the main usage areas helps increase the user's stamina and applies the correct amount of striking capabilities to any surface type. For climates that are rich in moisture accumulation, the Condor Richards model is the perfect fit. This model extends to an impressive 9-inch height, surrounding the foot and rising near the knee. This model is built from a treated leather at the outer shell. This shell features heavy amounts of stitching, reinforcing the build and keeping a strong hold on the mold. The shank of this model is designed via the build-up of leather panels. These panels overlap one another, creating for a stability mechanism that emits the proper, upright positioning for the user. Leather panels also completely surrounds the lace-up system, stretching to the cusp of the upper. This creates an additional pressure resistance system that keeps abrasions at bay. The interior of this model is lined with a thin, mesh design. This helps to limit the build-up of pressure and adds an element of breathability. The insole of this shoe surrounds the foot with cushioning, creating a smooth instance of comfort. The outsole of this model is built from rubberized compounds. The design is thick and tailors to an athletic design, creating the proper hike at the arch and thickening the supportive function at the front and the rear. The undercarriage design encompasses the use of thick grooves and grommeted extensions. This creates a stable platform that allows for safe travel across all surface types. Reebok creates an athletic, tactical model that hosts many different component inclusions for meeting a variety of the consumer's needs. First, this model is treated with a water-resistant coating, eliminating the threat of moisture. This feature is carried throughout the entire with lightweight mesh that prevents moisture build-up. This keeps the foot cool and works to create an even flow of air streams. This model also hosts a side zipper function for applying the correct fit and easing the accessibility of this boot. The toe box houses a composite toe, sampling lighter elements for protective means. This keeps the design of the toe box, allowing for a roomy fit. This model also features a full lace-up system that allows the user to apply the necessary hold overtop the foot. The model features an athletic outsole design. This creates a hike at the arch for supportive reasoning. This outsole is also layered to include a midsole. This mid-tier option helps to reduce the threat of pressures and shocks. The traction layer of the outsole features a heavy inclusion of spaced grooves. Not only does this limit the build-up of debris, but it also spaces the supportive mechanisms at an even-keeled stance. This applies for a solid foundation for push-off and landing. The athletic design also thickens the support at the front and rear of this boot. IODSON is a major contributor to the lightweight space with their Ultra-Light model. This combat boot design takes a simplistic approach to functionality, narrowing the focus to the main components of a sound build. This model is made from microfiber materials, a material that is extremely light, but holds a solid mold. It hosts similar properties to synthetics, but the weight is more comparable to that of a mesh. This also makes this combat model a minimalist build in the boot space. The minimalist function allows the user to gain natural feels from their movements and extensions, working in better cohesion with the differing surfaces of travel. Paneling is included throughout the outer shell with special attention placed at the heel. A wrapped panel stretches from the midfoot to the rear, creating a solid holding mechanism for upright movement streams. The outsole is design from a leather and rubberized combination, teaming to solid forces for increased protection. The wavy design helps cater to the natural pressure points of the foot, limiting the pressures in these prescribed regions. The undercarriage takes on a traction design that slices cuts into the mold, producing spaced extensions. These extensions are angled for travel across adverse and rough surfaces, heightening the stability for the user. Introducing another inclusion from Danner, the fabricated design helps to increase the natural feel of the model, heightening the sensibility of the design of the high-rise build. The Danner Tachyon model features a full lace-up system, with spacing between eyelets for increasing the pockets of hold overtop the foot. This spacing also helps the user apply a simple fitting and eases the access of the boot. A toe box cap is included to reduce abrasions and help hold the mold. This creates a roomy area for the toes to splay naturally and reduces upon fungal build-up at the interior. Speaking to the interior, it is lined with a thin, breathable mesh that reduces upon the build-up of moisture. The heel-backing features a reinforced shank. This shank includes the build-up of fabric, stacking the support to create for a successful heel pocket. This helps keep the heel from moving upon insertion and implements the notion of proper, upright functioning and movement. The outsole features thin build, helping the user access the properties of the surface for natural movement development. This makes the user's strides more effective. The outsole is designed with thick grooves and circular extensions. Ample spacing prevents debris build-up and spreads the support mechanisms to create an even-keeled base. Trailing back to the athletic discussion, we have another inclusion extending from Under Armour. Their Stryker model is the perfect fit for law enforcement and military usage, as it operates utilizing a lightweight build and enhanced protection measures. This model is built from a textile and fabric combination, both hosting lightweight functioning. To back the supportive means, checkboard textile panels are included on the sides of the upper shell. The design looks like a fence and the operational function is to defend against abrasions and moisture build-up. The side-by-side build also helps these mechanisms double as a midfoot support. A stitched toe box separator is also included to hold the design and reduce the threat of pressures and abrasions in this region. The lace-up system is designed utilizing elastic laces, allowing for a stretchy fitting that returns to proper, lockdown form. The outsole is designed with an even-keeled athletic build and is made up of rubber. It layers the supportive means, introducing a flat layer that operates much like a midsole. This helps to absorb shocks and reduce pressures. The traction layer remains relatively flat, introducing small, lined extensions that cater to rough and uneven surfaces. The bottom is also treated to prevent slips and keeps stability on slick surfaces. The second variant undergoes heavy treatment to become a waterproof model, citing the only difference between these two excellent inclusions. 5.11 Tactical makes a fighting case for inclusion with their two 6-inch models. The A.T.A.C design is a strong defender to the elements, teaming a material combination of leather and textiles. The leather covers a majority of the outer shell with the textile becoming a breathability inclusion at the sides of the boot. The outsole features a synthetic design for lightweight functioning. This model also goes heavy on the stitched paneling inclusions, heightening the protection at the toe box, midfoot area, and the heel shank. The interior of this model is lined with a lightweight mesh. It is treated to prevent moisture build-up and doubles as an antibacterial agent. The outsole is treated to host both oil and slip-resistant functioning. The undercarriage design introduces thick grommets that are evenly spaced for the reduction of debris build-up. The front of the outsole also creates a thick rim around the toe box, preventing from stubbing. The only difference between these two models is that one utilizes the zipper mechanism while the other does not. Both make for an ample fit in the police force, military, or other such working environments. While our list covering a wide-range of subcategories and types, we decided to create a small list of additional products that we would recommend. These products do not include a full review, rather a few telling points of what makes them worthy of hosting presence upon our list of inclusions. If you are a brand-specific shopper and you enjoy an athletic fit, sample from the products that Under Armour releases. We mentioned a few of their best sellers and their best builds, but additional inclusions do exist. For example, the men's Stellar Tac Zip model encompasses a strong build and introduces some of the proprietary functions Under Armour has become known for. The Infil model is a second that we would include in our list due to solid construction and increased lockdown. The second brand to stick to when it comes to function and reliability is the 5.11 Tactical brand. Their developments target specific components of the marketplace, creating teamed options to fit a desired area of usage. The EVO model is a waterproof fit that hosts usage in a multitude of environments. The Range Master takes on the mold of a shoe with boot properties, just falling a little short on the coverage scale to warrant a full review. To better help assess a boot for individual purchase, we must first list out the different categories of component parts. Below, the user will find the different component make-ups, detailed with the specific inclusions you should be looking for when purchasing. Comfort can be included at a variety of instances. One of the most common places for comfort is at the foot bed. A memory foam insole, gel insole, or other such orthotic inclusion will greet the foot nicely. You want to make sure you have a roomy toe box to let the toes splay naturally. A narrowed toe box is a common cause of discomfort and could lead to fungal build-up. Comfort also comes at the insertion point, with a collar that features some sort of padding or thickened extension. These pads and extensions will place a hold around the ankle, so it is important that these materials be soft or absorbent when fitting. Waterproof treatment is not uncommon, but it is often difficult to include this full-submersion title. To better combat moisture, production companies will bill their products with water resistant titles. This capability should cover the user during torrential rain fall and other such wet environments. The only difference between waterproofing and water-resistant capability is that waterproofing allows the boot to be submerged for a given period without taking in water. Most outer construction lends to the defense of these products, keeping waterproofing only for those who need to be submerged in water for longer periods of time. The outsole is often treated to a slip-resistant or oil-resistant coating. Many companies will access proprietary means to complete this function, but most coatings will last the life of the shoe. This helps to apply traction one adverse surfaces and it is a good inclusion for those operating in environments where any type of surface becomes fair game. This simple treatment is often included within the product listings and if it is not, it is a simple function that can be performed at-home. 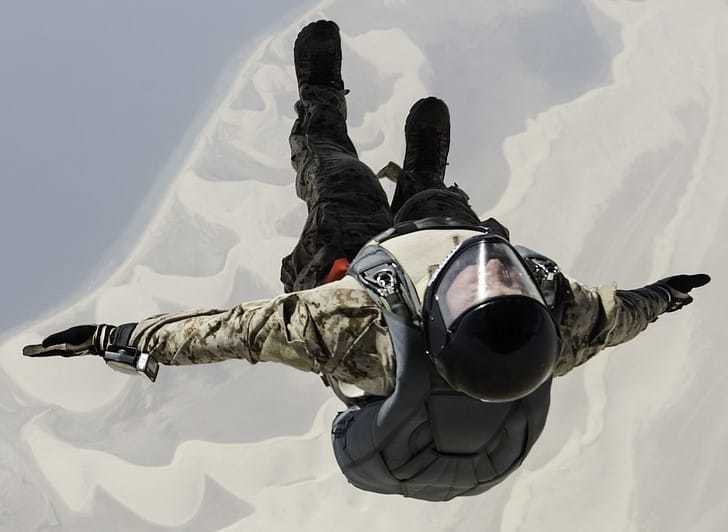 Hosting the capability to absorb shocks is an important feature for tactical boots to host. Operators often spend long hours on their feet, consistently moving. The component piece to look for would be the inclusion of a midsole. Often termed in EVA or lightweight, rubber builds, these soles help to diffuse pressures and spread shocks over this thin platform. This helps to reduce the feel the user receives, limiting the wear and tear on the feet. Sometimes, the outsole is layered and can access the properties a midsole would host without including this piece as a separate. This creates the ample amount of diffusion and marks for a good second selection. Breathability often comes in the at the side gores of a shoes. Lighter materials will be utilized to even out the weight of the model and influencing the positive flow of air to and from the boot. Other areas of intrigue for breathability to be introduced occur at the interior. Light lining once again teams to then build to provide moisture-wicking capabilities. Breathable exterior materials include textiles, synthetics, fabrics, and mesh designs. The main area for durability to become prevalent is at the outsole. This is the base the foot strikes upon on a consistent basis, causing for a reinforced and strengthened build to remain consistent. A durable build will also increase the performance of the boot, partnering with the shock absorption and pressure diffusion piece for comfort increases. These factors also play a role with stamina influxes, calling for this area to be sound and secure. It is often layered or stacked to better diffuse pressures and absorb these shocks. You will also notice heavy grommets being utilized for more coarse terrains and environments. Most boots are made from smooth materials, leaving them ripe for waxing and polishing. The fabricated material builds are the most difficult cleaning models. Most brands release cleaning products, with most coming with gel-like foams and bristle brushes for safe adhesion and application. Always cross-check the material type before applying chemicals to a surface to prevent material damage. You can also look for brands that treat the shells of their build to moisture resistant coatings, a second mechanism that can also be found on the marketplace for the user. With tactical boots, and all boots for that matter, applying the correct fit can be difficult. Most fits will run wide as they often compromise for spacing in the toe box and make up for it with thick padding inclusions. If you have naturally wide feet, most boots will fit snug. There are companies that make wide fits, but those are for extreme sizing cases. The wide-foot user will enjoy the format boot construction takes hold. If you have normal sized feet, you can afford to cut half a size from your normal athletic fit. The material spacing helps these models run naturally longer, allowing for the decrease for the user. Keeping a narrow fitting at the insertion point is the best-case scenario for the average sized foot. It helps introduce a holding mechanism that will set the tone for the interior fitting. After scaling through our list of inclusions and tailoring to the specific subcategories of the tactical space, we have come to a few select choices for the user. As it relates to an editor's choice, the 5.11 Tactical 8-inch model was the best all-around pick. The 8-inch height is the rise for complete coverage. The areas of usage expand beyond multiple subcategories, making it intensive for many different purposes. The strong, leather design combats pressures and resists abrasions. Treatment for water-resistance and slippage prevention also help this model climb to the top of our list. For the value pick, Ryno Gear is the brand to search. Their CoolMax lining model is made available at a fraction of the cost of other inclusions, centering the marketplace for any budget types. It also houses a zipper that latches via a Velcro strap for simple fitting and lockdown support. Hosting a comfort foot bed and a lining that keeps your feet cool and dry doesn't hurt as well. This brand also features additional extensions at competitive prices, marking them as our overall value choice.